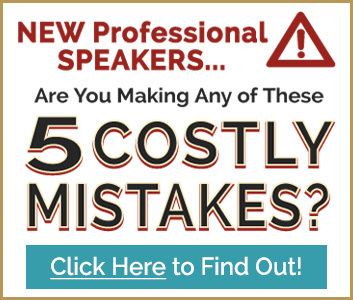 As I’ve worked with speakers over the years, I’ve come to understand that having a healthy email list is imperative if you want to build a strong professional speaking business. Just imagine how fun it would be to launch a new product, email your list about it, and wake up the next morning to $6000 in your PayPal account! Or, wouldn’t it be great if a meeting planner just called and hired you on-the-spot because he’d been reading your weekly articles, watching your videos, and was already confident that you’re the one who can motivate his audience? Having — and engaging with — your list of subscribers can result in huge benefits for your speaking business. This is the first in a series of posts to help you make that happen. Start building your list NOW. Be sure they actually want your opt-in gift. Gone are the days when website visitors are willing to hand over their email address just because they think you’re a nice person. Nowadays, we need to give them some kind of bonus or gift in return. It’s important to understand that your freebie needs to be of interest and of value to your potential clients & readers. So, if you speak or train for the credit union industry, what would be of interest to them? Perhaps it’s a tip sheet for dealing with difficult members. If your target market is the car rental industry, think about what would be valuable and interesting to them. Maybe it’s an infographic showing a clever, time-saving process for checking vehicles in and out on a busy weekend. You might also consider creating a 5-part video or audio mini-training. Use an auto-responder to distribute each lesson to people via email. There are plenty of options available… we just need to find the one that is most needed by our target market. Ask for a minimum amount of information. Have you ever wanted to sign up for somebody’s newsletter, but changed your mind after seeing how much ‘required’ information was needed? Asking for too much or irrelevant information is a great way to not grow your list. Typically, an opt-in box will request email + first name, with both fields set to ‘required.’ Last name, if included at all, is most often optional. When you’re building your email list, there’s no need to ask for a physical address, phone number, etc. If a person is buying something from you, they’re fine with sharing that info, but keep it to the bare minimum when it’s just a newsletter subscription. Never, ever, ever, ever share or sell your list! Finally — and most importantly — it is absolutely unacceptable to ever share or sell your subscriber list. Absolutely unacceptable. These people are giving their contact info to us because they want to hear from us… not from some marketing company or another speaker or a service provider. Just us. We can refer to other people and companies IN the messages we send out, but that subscriber list must remain absolutely private. So, there ya go! 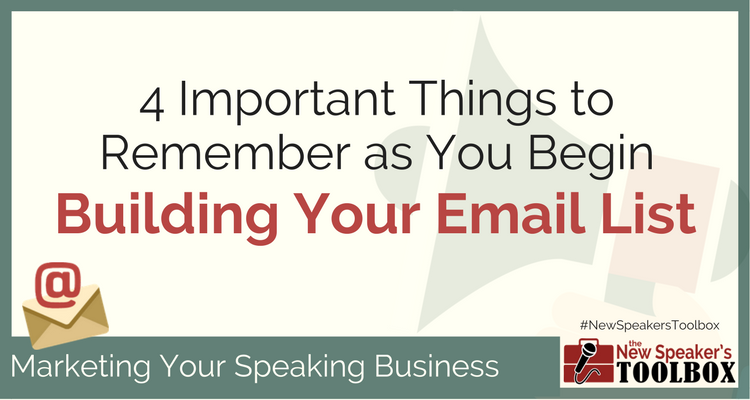 Most speakers don’t even have an email list. Plan for success down the line by getting started right away! P.S. Keep in mind that it’s not the size of your list that matters. It’s the quality. We’ll discuss this in an upcoming post! Known by some in the speaking industry as “the Butterfly Herder,” Cynthia works closely with emerging professional speakers as they grow from speaking as a hobby to getting paid to speak full-time. In addition to creating websites for professional speakers, she consults in the areas of online presence & credibility, public relations, and content & product creation. 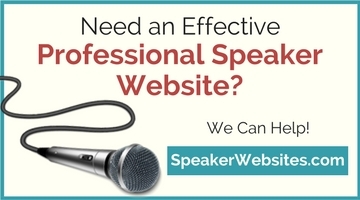 Visit her website at www.SpeakerWebsites.com. You’re very welcome, Trish. Glad it was helpful to you!